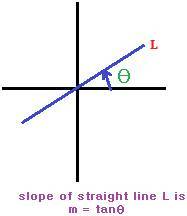 One of the properties of a straight line is slope. Slope is denoted by the letter ‘m’. x1, y1 are the coordinates of one point and x2, y2 are the coordinates of another point. Beyond this notation, no special significance is attached to the coordinates of the points in respect of sequence of points. It appears from the subscripts used for the coordinates that there is a first point and a second point. But, this is purely a misgiving. You do not have to assume of any such convention. The coordinates of any point serve to be taken as x1, y1 and those of the other as x2, y2. Find difference of y coordinates and x coordinates in the same order. After finding difference of y coordinate in one point to that in the second, do not make the mistake of finding the difference of x coordinate in the second to that in the first point. Consider two points A (3, 6) and B (6, 9). 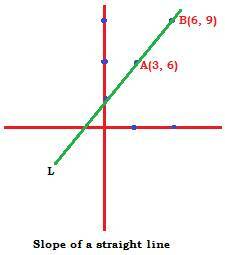 What is the slope of the straight line L passing through the two points A (3, 6) and B (6, 9)? This equation is said to be in general form. In the figure, the straight line L makes an angle θ with the positive direction of x-axis. The angle is counted anticlockwise from the x-axis to the straight line.